The Old Post Office Pavilion in Washington D.C. is a Pennsylvania Avenue landmark that’s popular with tourists. The federal government, which controls the building, has wanted to find a more profitable use for the historic building. 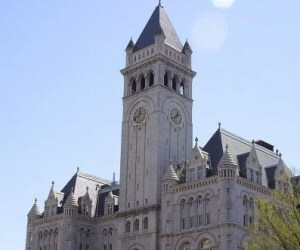 Recently, the General Services Administration awarded redevelopment rights to Donald Trump’s real estate organization, a sign that major changes would soon come. Small businesses wondered about their fate and if they would be included in the Donald’s redevelopment plans. Those plans, recently unveiled to the public will repurpose the historic space into a luxury hotel. This redevelopment, led by Ivanka Trump, would still allow public access to the bell tower’s observation deck. The Washington Post details the situation’s facings several of the dozens of small shops and food vendors that have called the landmark site home for nearly 30 years, who are being forced to move.